If you are unable to attend an appointment with one of the doctors or nurses, please telephone or use the Online Services link to cancel your appointment. Results of smears, swabs, x-rays and blood tests are available by phone between 3:00pm – 6:00pm, for the patient only. Please note that results normally take one week to be notified to the practice. It is the patient’s responsibility to follow-up on their test results. routine - Flu and Pneumococcal for at risk groups. child - The baby's red book must be brought to the appointment. travel - Travel advice is provided.See the nurse at least 8 weeks before your intended date of travel. Contraception information - Advice on the range of contraception available. Free contraception is available (pill prescriptions, contraceptive injections, condoms & ‘emergency contraception’). Emergency contraception is also available at these chemists, and can be obtained without seeing a doctor or nurse first. All other forms of contraception (e.g. coils and implants) are available at these Sexual Health Clinics. General family planning advice is also available. Cervical smears - Please ensure that your smear appointment is approximately midway between periods. (i.e. 2 weeks after the start of your period). New registration health checks - All newly registered are advised to have a general health check up. This includes measuring height, weight, blood pressure, urine testing, smoking and general healthy living advice. Health and dietary advice - Advice on healthy eating, lowering cholesterol levels, weight management and healthy living. Their primary role is to ensure that families with children under five years old are growing and developing normally. They also advise on routine immunisations. The District Nurse and her team are involved in the care of housebound people in the community. They may be contacted Monday - Friday between 9am - 5pm on 020 8314 7777. The midwife takes part in our antenatal clinics and looks after pregnant women in our community, delivering babies at home and in the hospitals and providing them information on diet, exercise, general health and maternity rights. We have our own attached midwife who also runs antenatal classes and can provide you with further information about these classes. These clinics allow you to discuss various forms of contraception and fertility advice. It is also an opportunity to discuss issues surrounding sexually transmitted diseases. Pill checks and free condoms are provided by the nurse. Family planning advice is also available during any normal doctor & nurse sessions. Coils (IUD implants) and implants are done at this surgery by the appointed Doctor. Addresses of other local Family Planning/Sexual Health Clinics that provide these services are available. This clinic helps to ensure that your pregnancy is progressing normally and problems are treated as they arise. It is also an opportunity to discuss any issues in your forthcoming pregnancy and to promote good health to ensure a healthy mother and baby. The choices of delivery options are discussed and arrangements made accordingly. If you suspect you are pregnant, do a home pregnancy test first. Once the pregnancy is confirmed, you will need to book an appointment to see midwife on 07787 841986. The first scan is offered at 10-12 weeks, so it is highly recommended that you are seen before you are 10 weeks pregnant. Postnatal examinations are essential for new mothers. These appointments provide routine checks for patients with asthma and high blood pressure. Advice on self-help and monitoring is available. The Minor Surgery clinic offers the removal of moles, skin tags and other ‘lumps and bumps’. Injections for muscles, tendons, shoulders and joints are also performed at the surgery by the doctor. These checks include general health advice (smoking, alcohol, basic sexual health) and check-ups (blood pressure, weight, height). Female patients may have cervical smears and general information on breast self-examination. Male patients may get advice on testicular self examination. This is NOT an emergency service. What is the Flu vaccine for? 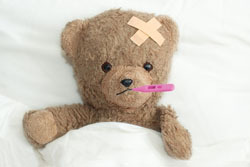 Influenza, also known as "flu", is a very contagious disease. It is caused by the influenza virus that can spread from infected people to the nose or throat of others. Influenza can lead to pneumonia and can be dangerous for people with heart or breathing conditions. Influenza can kill and particularly affects the elderly. People 65 or older are considered high risk for complications. The flu shot, or influenza vaccine, is a mixture of dead flu viruses that prepares the immune system to fight the actual virus if it enters the body. Getting the shot does not guarantee that you won't get the flu, but it does mean that you have a much smaller chance of getting sick from it. Who is eligible for free Flu vaccines? The best time to be immunised is in October or November. This is because the influenza season usually peaks anywhere from November through May and it can take about 2 weeks for immunity to develop after the vaccination. 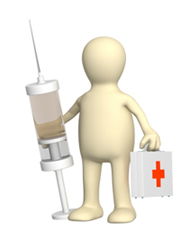 Because the influenza viruses are constantly changing, each year an updated vaccination is available. It is recommended that an annual vaccination is received. Does the flu shot have side effects? In most people the flu shot causes no reaction. The viruses in the shot are dead, so you cannot get the flu from it. In some people, the flu shot may cause mild side effects, including soreness, redness, or swelling where the shot was given, fever, and aches. These mild symptoms usually begin soon after the shot is given and last one to two days. Like any medication, the flu shot can cause a serious allergic reaction, but the risk of this is very small. If you have any unusual problems a few minutes to a few hours after getting the shot, such as high fever, difficulty breathing, hives, weakness, or dizziness, call your doctor right away. What is the Pneumococcal vaccination for? Pneumococcal disease is an infection caused by the bacterium streptococcus pneumoniae which usually lives harmlessly in the back of many peoples’ throats. However, it can invade other parts of the body and cause serious, possibly life-threatening illnesses, notably pneumonia, septicaemia or ‘blood poisoning' meningitis. Pneumonia — a bacterial infection in the lungs — is a common complication from the flu. In addition to an annual flu shot, it's a good idea to get a once-in-a-lifetime pneumococcal vaccine. The Pneumococcal vaccination can help prevent disease. It is better to prevent the infection occurring in the first place, rather than having to treat it with antibiotics. Pneumococcal disease can strike at any time of year; so the sooner you get vaccinated the better! Why get the pneumococcal vaccine? The shot protects against almost all of the bacteria that cause pneumonia. It's safe. Most people only need one shot to protect them for the rest of their lives. Who should get the pneumococcal vaccine? People age 65 or older; People with a chronic illness such as advanced breast cancer, heart or lung disease, or diabetes; People with a weak immune system due to illness and/or the effects of chemotherapy; Residents of nursing homes and other long-term care facilities. The good news is that for most adult patients, the pneumococcal vaccine is given only once. However, some people, especially those with immunological defects and spleen problems, may need a second dose. It effectively prevents illnesses in children over 2 years old and adults at risk. Pneumococcal pneumonia accounts for 10-25% of all pneumonias. This immunization is not effective against pneumococcal diseases in children under 2 years. There is a different vaccine, the pneumococcal conjugate vaccine, which is routinely given to younger children. Determining the vaccinations you require when traveling abroad depen ds on the individual country you are traveling to, your existing medical conditions and any medications you are currently taking. Therefore, information about which vaccines you will need CANNOT be given over the phone without a prior assessment by the practice nurse. If you are planning a trip abroad, it is recommended that you visit the practice nurse at least 8 weeks before your travel date as some jabs take time to reach their full effect. If you have not previously been immunised against diphtheria, polio or tetanus or are due for a booster, this is an ideal opportunity to have the vaccinations. You may choose to have your vaccines at the practice or at a special travel clinic should you wish. Please note that vaccines for yellow fever and rabies are not available at this practice.